Rugged reliable HX3 supports wireless and wired barcode scanners, imagers and headsets. The smooth-talking HX3 voice-dedicated computer offers industry-leading versatility for your voice-directed logistics applications. 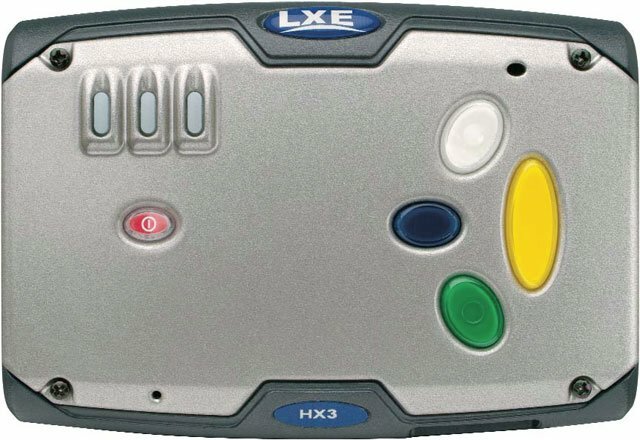 Built with ToughTalk technology, a specialized combination of LXE's trademark rugged system design, advanced audio circuitry and noise-canceling techniques, the HX3 voice computer is ready to support today's best-of-breed voice solutions. The hands-free computer also supports wireless and wired barcode scanners, imagers and headsets. And, a simple programmable keypad executes common tasks easily. The HX3 not only does without a display, it also does not have a keyboard. Instead, there are just four large buttons: blue, white, green and a large yellow one. That's it. The entire operation is via voice interaction between the HX3 and the user. The LXE HX3A0B1B2A1A0US is also known as LXE-HX3A0B1B2A1A0US	.